Never doubt Andrew Lincoln’s commitment to a role. 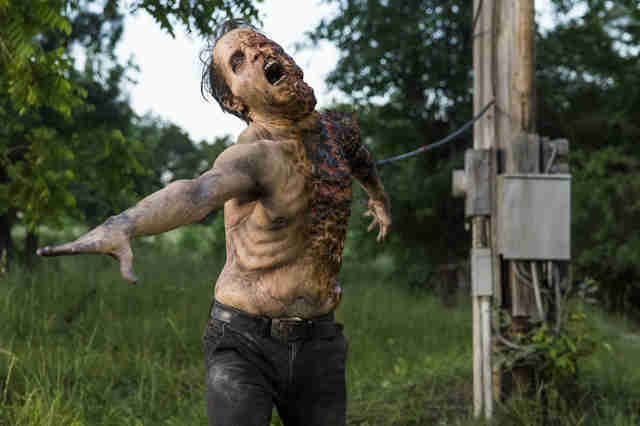 The enormously beloved English actor has spent nearly eight consecutive years in the bedraggled shoes of Rick Grimes, the small-town-sheriff's-deputy-turned-sometimes-savage-apocalyptic-leader who is the nominal hero of AMC’s never-ending zombie drama, The Walking Dead. As Grimes, Lincoln has been obliged to howl, weep, and bleed profusely, and there seems no end to the punishment he’s willing to take — as made clear last season, which found him beaten and humiliated by the nefarious super-villain Negan. 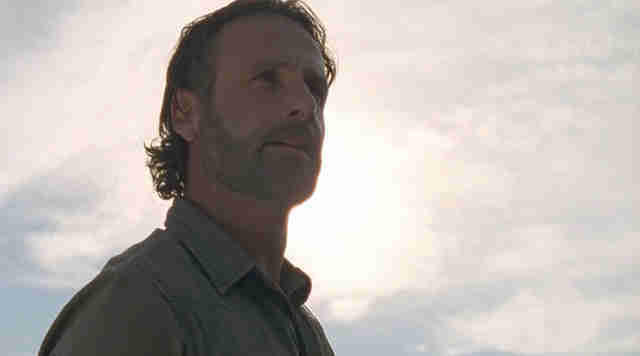 That seems poised to change this year, as Rick fights back and leads the charge in the battle for undead supremacy. 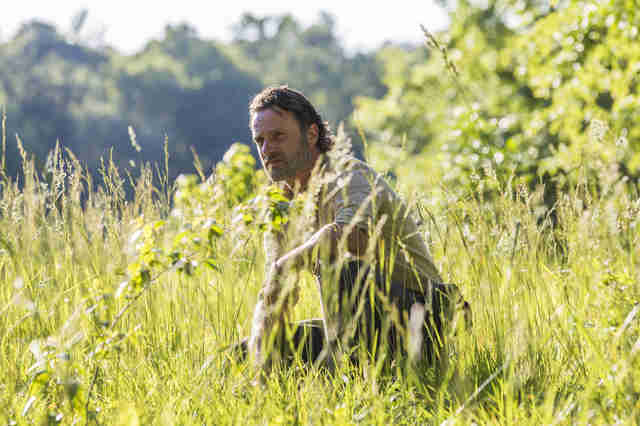 As all the while one question hangs over the man’s head: In a show where anyone can seem to die at the drop of his hat, could Rick Grimes himself be next to go? Thrillist caught up with Lincoln on set to talk about violence, hope, and whether the long-time TV actor plans to return to movies. Thrillist: We’ve just been roused by your inspirational speech at the end the premiere. This seems like quite a different direction for the season. Andrew Lincoln: Absolutely. I think what you saw was a man living, at the end of the last season, at the edge. His defiance towards Negan seemed a testament to what he’d do for Carl. I think that idea, that sentiment, is articulated in the speech, which is that no matter what comes next, no matter what hardships come next, we’ve already won, we’re free. We are free. The person saying that — that’s a considerably different man than the man you saw last season. It’s sort of the yang to last year’s yin. The reaction to last season was rather negative — particularly toward the extreme violence. Critics have called it gratuitous, and even exploitative. Do you think it crossed a line? Lincoln: That’s a difficult question for me to answer, to be honest, because I don’t actually watch the show that I’m on. I do know the people creating the show are incredibly responsible when it comes to violence. Now, I think everybody can improve, in all respects. On a personal level, I mean. I think we can all improve: we can all be kinder, more caring, more considerate, and more tolerant. On a personal level I think I could be. But the problem of violence is something we take very, very seriously on set. Right now we’re going into a season that is called “All Out War.” I like to think we’re telling a story that is action-packed, and full of thrills, and moments of heroism and excitement — but at the same time, I like to think we’re telling a much deeper story, about the cost of war and conflict. Psychologically and emotionally. So you don’t agree that it’s excessive. Lincoln: This is a story I am very proud of and that I stand by. I have great respect for the people writing it. So while I don’t agree, I do think we have to very careful about the line that we walk between entertainment and sensationalism. And I know that it’s true that the people making this show are cautious of that. Is The Walking Dead a moral show? Lincoln: Yeah. I think as you’ll see, yep. I mean, “morality,” it can be a very trendy word. Discussions of morality have become fashionable in my lifetime. But I certainly think that it’s a human story. Let’s talk about not a moral story, but a human story. You know, it was always important to me that we talk on a creative level about the human inside the monster and the monster instead the human, and I think that’s absolutely the embodiment of the series. And of course it’s also a survival story. It’s a story about humans trying to survive both physically and emotionally. 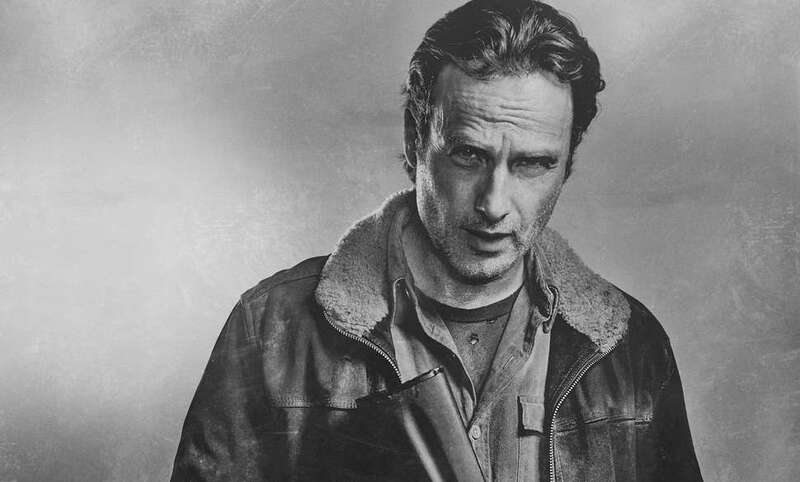 I think this season is reminiscent -- at least for me, Rick’s arc -- of a man trying to determine whether his mercy will prevail over his wrath. I mean, he says as much in the premiere. Will my mercy prevail over my wrath? That’s the overarching theme for my character. I think that a lot of the other characters asking a different question: why are we fighting, and what is the cost of it? Are those not moral questions? If that’s not moral, I’m not sure what is. Well that’s an interesting point: we want Rick’s mercy, his goodness, to prevail. So many of the characters we see on TV these days have the opposite arc: it’s about normal people becoming anti-heroes, people becoming morally compromised. But Rick is a fundamentally good person struggling to continue to be good. Lincoln: I think you’re right. That’s certainly how I see him. What’s happened is, he’s been hammered and beaten and broken. That trauma has brought him into the place where sometimes he’s unrecognizable — and his behaviour is beyond all recognition sometimes, in order to protect his loved ones. But fundamentally he’s a man who is grief-stricken. He’s desperate to hold onto some semblance of who he was, of the man he used to be. And I think perhaps that man will appear this season. The premiere is so action-packed, as you’ve mentioned. Is there still room this season for some of the emotionality we’re used to on the series? Lincoln: The season is anchored by some of the biggest deaths we’ve ever encountered in a hundred episodes, is what I will say. And yet there seems to be more hope on the horizon than before. Lincoln: Without a shadow of a doubt. There’s more of what I think of as the combination of qualities that make up my favorite episodes: there’s action, there’s adventure, there’s a strong sense of solidarity, and yes, hope. Absolutely. It’s huge throughout the season. Also I get to play with a lot of my favorite friends I’ve made on both sides of the camera this season. On screen, especially, I will get to hang with a lot of my best buddies, which is always thrilling. You’ve been with the show for seven years now. How, as an actor, do you keep it interesting? How do you make it fresh for yourself every day? Lincoln: I mean, that’s not in my job description. That’s a writer’s responsibility, and then it’s my duty to simply translate that into something interesting. But if it weren’t on the page, I wouldn’t be able to do it. I think what they’ve done so well on this show is keep pinching him and twisting and turning him and recalibrating what a serial looks like. I used to say that Rick is a man who always does what he can. But when he’s battered out of shape, and broken in so many different ways, what does that look like? The lovely thing that’s always been at the heart of the show -- and more than ever this season -- is that it’s your friends and family who not only hold you together, but hold up a mirror, as well, to remind you of who you are. That’s one of the best things this season. I’m playing with a lot of actors with whom I have a shared history on-screen and off. You feel you have a strong bond with the cast and crew? Lincoln: Absolutely. They’re my family. I’ve spent more time with these people than my actual family in a working year. I know them inside and out. We show up to work and we have to get the energy going. You look at someone you know. Someone makes you laugh. Someone gets a war-cry going. And before you know, you’re up and at ‘em. It’s an amazing relationship. The show is made by 350 people. You only know 25 of them, because they’re on screen. The rest are the unsung heroes. They’re amazing. Do the bonds formed on a television show make it difficult to do a movie again? You haven’t appeared in a film, even once, while the show has been on the air. Lincoln: No, no. I’m really excited to do a film again -- in fact there are two projects I’m really interested in at the moment. But there is a certain sense of caution for me. I’m cautious, because you do want to curate the right people to work around. That’s the big concern. We’ve come up with an amazing work environment here, and I would love to replicate that. Your fellow cast members do tend to land other shows and movies easily. Lincoln: Yeah, we have a brilliant catch and release program here. Look at Soniqua [Martin-Green]: she’s on the new Star Trek. She’s an amazing woman and an incredible leader and she will be building an incredible community around her there. That’s always what you need to do. You need to surround yourself with people who want what you want, which is to tell the best story in the most effective way possible. When you see Soniqua go to Star Trek, or Norman making a film on the side, do you envy them? Does it make you think about next steps, or career moves you want to make? I mean I assume your lack of films is not for want of offers. What would it take to tempt you at this point? Lincoln: Look, of course there are many, many people I would love to work with. It’s just a very difficult logistical problem right now. This job occupies so much of my life. And I am a family man first. My agents wouldn’t want to hear this, but I am about family. This is enough responsibility on my plate for the time being. If and when — more when than if — Rick is finally put out to pasture, I will definitely be looking for interesting films to work on. That’s what I want to do. That’s what I always want to do: tell interesting stories with brilliant and original minds. Whatever film that is, that does that, I will do it, and there are two films I’m incredibly excited to work on down the road. Calum Marsh is a freelance writer with a love of the undead and an eye toward the future.